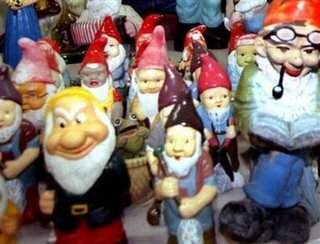 It's being called the "Gnomesville Massacre" and emergency workers in Western Australia are offering a reward for the capture of vandals who smashed their way through a local tourist attraction. An unknown number of attackers lopped off the heads or smashed several dozen of the pot-bellied statues this week at Gnomesville, a collection of more than a 1,000 colorful characters deep in a forest south of Perth. "We are incensed by the damage done to the gnomes and willing to pay a reward to catch the culprits," State Emergency Service Volunteer Association President Phillip Petersen told Reuters. Six orange-colored gnomes depicting emergency workers were among those destroyed, Petersen said, adding the reward was A$500 ($390). The population of Gnomesville has grown from a handful of statues placed covertly in the forest a few years ago, making it a popular stop off for tour buses visiting nearby vineyards.